Some of you may know me as the “foundation queen”. I have hundreds of foundations because I have been searching for just the “right one”. It is because I am crazed. In my crazed beauty quest I am obsessed with finding the perfect foundation. It may not even exist. I love foundation. It is the base in which we set all the rest of our makeup. The basis for which our face shows itself to the world. Good skin shows up looking amazing through the right foundation and well, bad skin can only look so good in any foundation. It is important to take care of your skin because makeup can only hide so much. Foundation is a very important step in the makeup process. I am extremely pale, so pale that finding the perfect shade of foundation is almost impossible for me. I go around daily with this yellow face and white neck. Yes. I dislike it. I try to mask it with powder but there is only so much that powder can do. I have pretty good skin and really do not need foundation to the extent that I only wear it to cover up my freckles. I like to have a porcelain finish. 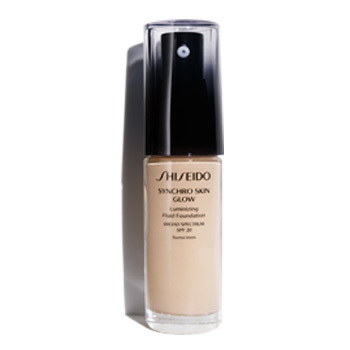 Shiseido's Synchro Skin Glow Luminizing Fluid Foundation is a smart, hydrating foundation that works with your skin’s condition throughout the day for a dewy glow without any shine. It has Advanced Sensing Technology that synchronizes with skin’s tone and moisture levels throughout the day for a perfected complexion. Skin looks fresh and beautiful as visible fine lines and the appearance of pores are reduced. This foundation delivers a luminous finish with buildable coverage while the lightweight, serum-like texture feels as if you’re wearing nothing at all. It has Argan Oil. Cranberry Seed Oil and Yuzu Seed Extract to create a moisturizing effect and help skin retain moisture for a youthful suppleness. A Super Bio-Moisture Network prevents an uneven finish with the foundation that is caused by dryness and instead opts for a more lustrous look. Wild Thyme Extract helps to provide anti-oxidant and anti-aging benefits. This foundation delivers a luminous long-lasting finish and 8-hour hydration. It also contains a broad spectrum SPF 20 made from Octinoxate 4.9% and Titanium Dioxide 2.0%. It comes in 13 shades. How to Use: Shake well. Apply after skincare, smoothing on evenly from the center of the face outward. Build your desired coverage level with additional layers. Covers imperfections beautifully with its buildable coverage. This foundation has my shade. I wear Neutral 1. I have also tried out Rose 2 and it works okay too. Below you willl see some photos of me wearing this new foundation. Compared to its counterpart (Synchro Skin Lasting Liquid Foundation SPF 20), this foundation is also just as good. It has great coverage, it wears well although not as long as its counterpart but long, and it makes your face glow like it is surrounded by a halo. So your skin always looks luminescent and beautiful. Right now that is what is popular. A glowy face, shimmery cheeks, matte lips and matte or shimmery eyes (you can get away with either). Makeup trends may always change but beautiful skin is always in. I like the sunscreen in this one too, it tends not to be irritating. I think it is wearable by most skin types, even acneic. However, if you have blemishes on the skin, the "glow" will make them look more prominent. Guaranteed. So be aware and think first before using. Skin needs to be in good condition for this foundation. Shiseido Synchro Skin Glow Fluid Foundation SPF 20 retails for $45.00 (1 f.oz./30 mL) and can be purchased online at www.shiseido.com, www.bloomingdales.com, www.sephora.com, www.macys,com, and www.nordstrom.com. It can also be purchased at Shiseido counters at the brick and mortar stores of these stores listed above. Like Shiseido on Facebook: https://www.facebook.com/shiseido; Follow Shiseido on Twitter: @shiseidoworld; Follow Shiseido on Pinterest: http://www.pinterest.com/shiseido/; Subscribe to Shiseido on YouTube: https://www.youtube.com/user/shiseidousa and Follow Shiseido on Instagram: http://instagram.com/shiseido.